JRR Tolkien’s First World War revolver used during his time as a Signal Officer on the Western Front is now on public display at IWM North, part of Imperial War Museum, in Manchester. The revolver has been put on display ahead of the opening of IWM North’s major exhibition ‘From Street To Trench: A War That Shaped a Region’ in April 2014 to mark the First World War Centenary. Tolkien is probably known for his authorship of the fantasy novels The Lord of the Rings trilogy (1954-1955) and The Hobbit, or There and Back Again (1937). This novel and series of novels have been (or are in the process of) being converted into successful cinematic adaptations with the most recent example being the first in a trilogy of films based on The Hobbit which was released in UK cinemas in December 2013. Many commenters have drawn parallels between Tolkien’s experiences in World War Two and his novels, in particular the popular The Lord of the Rings published just under a decade after the war had ended. 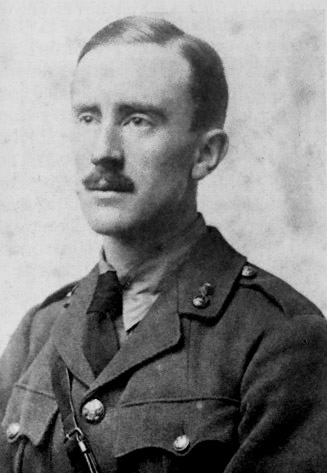 J. R. R. Tolkien (aged 24) in army uniform, photograph taken in 1916. Image available in the public domain via Wikimedia Commons. So what were Tolkein’s wartime experiences and how did they shape his later fictional works? Tolkien choose not to join up when war broke out in August 1914. but instead joined the Officer Training Corps at Oxford and thus deferred his enlistment until he completed his degree in July 1915. Upon graduating from Oxford with a first-class degree in English Language and Literature in July 1915, Tolkien was commissioned as a Second Lieutenant in the Lancashire Fusiliers as part of Kitchener’s “New Army”, the volunteer army which had succeeded Britain’s small professional army. The small professional army which had been part of the British Expeditionary Force (BEF) in August 1914 and beyond had suffered an extremely high casualty rate early in the war and was gradually replaced by the “New Army” of which Tolkien was a member. Tolkien then trained in Staffordshire for eleven months before begin transferred to the 11th (Service) Battalion with the British Expeditionary Force (BEF). In March 1916, Tolkien was granted leave and on 22 March 1916 he married his childhood sweetheart Edith Bratt. When Tolkien was sent abroad, Edith was deeply concerned about her husband’s whereabouts and safety. In order to circumvent the British Army’s postal censorship, Tolkien and his wife developed a secret code which Tolkien used in his letters home to indicate his movements on the Western Front. In early June 1916, Tolkien’s battalion was sent abroad to France. Tolkien receiver three weeks’ training as a signals officer at the British Army camp at Étaples. Tolkien was appointed Battalion Signal Officer and was responsible for maintaining communication between officers on the frontline and more senior Army officers directing the battle from Battalion Headquarters behind the frontlines. Tolkien learned how to use field telephones, flares, signal lamps, Morse code buzzers, carrier pigeons, and runners to keep the lines of communication open. In July 1916, the 11th Battalion was sent to the Somme to join the joint British-French attack to break through the German lines, later known as the Battle of the Somme. Fortunately for Tolkien, his battalion was assigned to the reserves at the beginning of the battle and did not take part in the initial attack. Instead Tolkien and his battalion were sent to the trenches a week later and took part in the protracted and unsuccessful attacks that continued the Battle of the Somme into the autumn of 1916. Tolkien and his battalion occupied front-line trenches at Beaumont-Hamel, Serre and the Leipzig Salient. 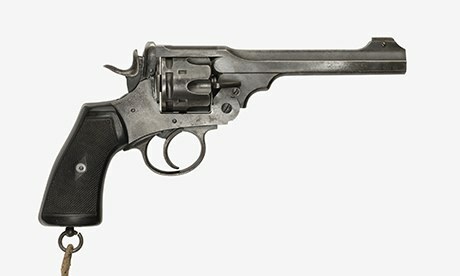 Tolkien’s revolver now on display at the Imperial War Museum, a Webley Mk VI, was the standard issue gun for British servicemen at the outbreak of the war and dated from Tolkien’s time in the trenches. Frontline conditions made signalling and Tolkien’s role especially challenging: chaotic conditions with damaged apparatus, broken telephone lines and mud everywhere made communication unreliable and impractical. Furthermore, the Germans were successfully intercepting British and French frontline communications during this period meaning telephone and Morse code buzzers were insecure. Thus with the practical introduction of the Fullerphone being a few months’ away, signallers were forced to rely on more traditional modes of communication including runners, visual signalling, and carrier pigeons. In October 1916, Tolkien contracted “trench fever” which was a disease common in the basic frontline conditions and was carried by lice. In early November 1916, Tolkien was sent back to Birmingham to recover. Shortly after Tolkien’s arrival back in Britain, his battalion was almost completely wiped out. Tolkien never saw frontline service again and a physically weakened Tolkien spent the remainder of the war alternating between hospitals and garrison duties. Tolkien remained in hospital recovering from trench fever until early 1917 when he was deemed medically unfit for general service and was posted to garrison duties in camps in England until the end of the war. After the war, Tolkien worked at the Oxford English Dictionary and the University of Leeds, amongst others, while he also began writing. In 1925, he was appointed a Fellow at Pembroke College, Oxford where he began to write the Hobbit as well as the first two volumes of the Fellowship of the Rings. John Garth. Tolkien and the Great War: The Threshold of Middle-earth (2003). About the author: Dr Elizabeth Bruton is postdoctoral researcher for “Innovating in Combat”. See her Academia.edu profile for further details. This entry was posted in Frontline Signalling, Military, Telephone and tagged First World War, JRR Tolkein, Lord of the Rings, revolver, signal officer, the Somme, world war one on 29 January 2014 by Elizabeth Bruton.